The clapperboard has been an essential part of film production since its earliest days. The clapperboard really consists of two elements: the slate and the actual clap feature. The purpose of this is twofold, and comes out of the traditional non-sync days of film production. The slate is where you list relevant information for the scene that the film editor will then use to organize the takes during post-production. This information will include the date, the name of the project, the scene number, the take that is indicated by a letter, the name of the director of photography, the name of the director, the time of day, and whether or not it is sync sound. The clapper is then used to be a marker so that the film editor is able to sync the sound to the video. The sound of the clapperboard hitting can be synced to the frame where the clapperboard hits, therefore ensuring the entire track will be in sync with the audio. Digital clapperboards and electronic clapperboards have been bringing a high tech option to replace the hand drawn slate and physical clapper, and you will rarely find a traditional clapperboard on a professional set. The electronic clapperboard is now the default for large film production sets and its main purpose is to transpose a digital timecode onto the clapperboard to communicate to the post-production staff. This allows for a direct connection between production and post-production so that the process can be streamlined and organized for very large-scale projects. You may also find electronic clapperboards that provide even more digital information, often costing up to a few hundred dollars. In general, you are going to find that the standard reflects a traditional clapperboard with the SMPTE timecode for coordination, but if too much information has to be entered in without writing, it is not as responsive to the set. The newest wave of the digital clapperboard are in the form of mobile apps, usually for the Apple iPad. Because of the iPad's physical structure it can reflect the relative size and dimensions of the clapperboard through the touch screen. Here you enter in the scene information directly as digital information that is then listed on the image of the clapperboard, and then the actual clap used for syncing sound can be done with a graphical imitation of the clap or a substitute like a bright white flash. There are a number of options for digital clapperboard iPad apps at the iTunes App Store, most of them running for under ten dollars. 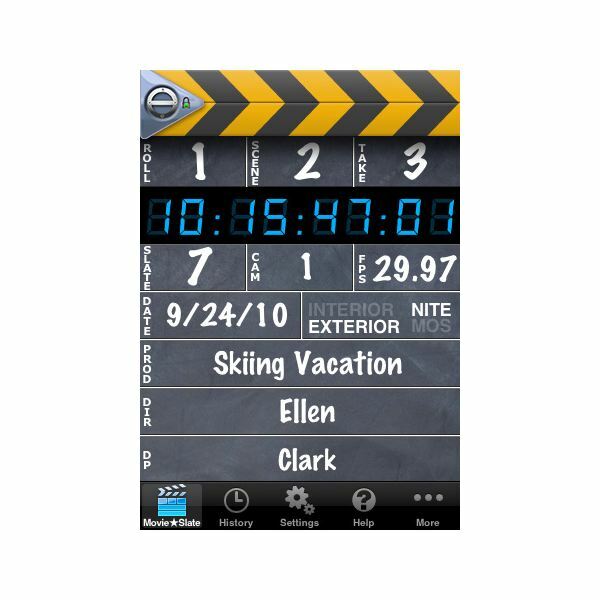 Higher end digital clapperboard iPad apps such as Movie Slate combines a very detailed digital clapperboard with a shot log, and gives you a whole host of different features as well as a nice graphical representation. Though you are not going to be able to find a high quality digital clapperboard iPad app for free, it is still more versatile and inexpensive than actually purchasing and working with a traditional clapperboard or electronic clapperboard. Try a few of these out before you actually go for them, but most of them are similar in terms of features, so try to find the one that will show up the cleanest on digital video or film.